Ever since I tried Tom Ford Private Blend Lip Color in Pink Dusk, I have been obsessed with this lipstick line for its premium quality and beautiful packaging. I have refrained myself from buying more Tom ford lipsticks because of its hefty price tag, but I can't help hoping to see more beauty lines by Tom Ford! I am glad that he doesn't keep us waiting too long. 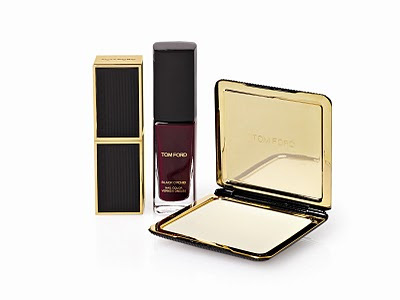 According to The Beauty Alchemist, Tom Ford will release limited-edition Black Orchid Collection (USD$140) in Neiman Marcus, Saks Fifth Avenue and Bergdorf Goodman stores in October. This collection includes Private Blend Lip Color in Black Orchid, Pressed Eau de Perfume Black Orchid and Nail Color in Black Orchid. You may check out the close-up and swatch of Tom Ford Nail Color in Black Orchid on famed nail artist Sophy Robson's blog. It is a gorgeous vampy brownish red shade I like to wear in fall and winter! Also, the black cuboid case of Black Orchid lipstick is sleek and classy! I can't wait to see this collection in person. I am obsessed with Tom Ford's Black Orchid, realized this morning that I lost it..off to buy a new one.